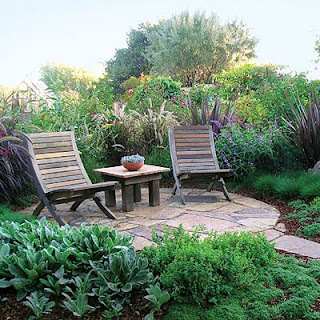 Patios made from slate, brick, flagstone, crushed rock, even mulch, are classic, easy-to-care-for designs. Versatile, slate and brick are ideal for small or large patio spaces and can be laid in a circular pattern or more traditional square or rectangular shape. 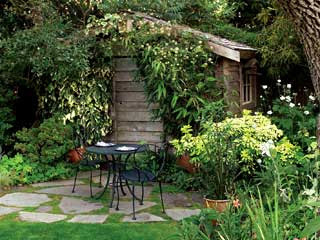 For a remote or unused corner of a garden, place the slate in a circular pattern. 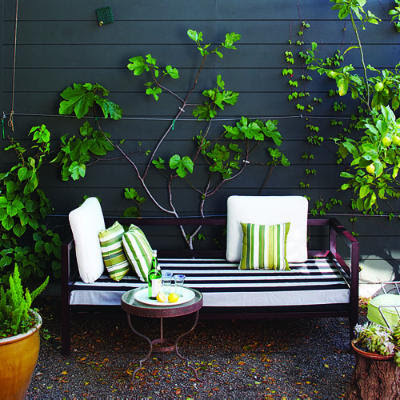 Tuck a cozy bench along an unused wall to create your own intimate patio. Crushed granite is an easy and low maintenance stone to spread as the patio "floor". 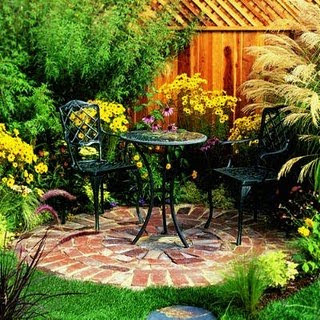 The round, inviting shape of a circular patio beckons for a patio furniture set or bird bath. Along the brick patio, tuck perennial flowers like coneflowers and verbena flowers for bright bursts of color to the landscape. Low-growing, spreading flowers like cotoneaster provide a bright burst of green to the patio. I am totally agreed with your this statement that patios made from slate, brick, flagstone, crushed rock, even mulch, are classic, easy-to-care-for designs. I appreciate and like it.